I Love brownies!! But always I was hesitant to try baking. My previous experiences scared me way too much to even think about it. But now after trying so many times.. Now getting confidence to bake.This is my first try for brownies. I have taken this recipe from here .These are quick, simple and delicious! Thats a delicious and my favourite...looks yummm! 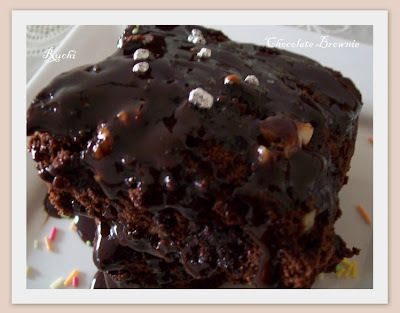 !feel like having few rite now..
Brownies look melting, moist and delicious Jaishree !!! Brownies look fab! Isnt 2 cups sugar too much for 1/3 cup of flour? thats looks sooo delicious and just loved the creamy texture..